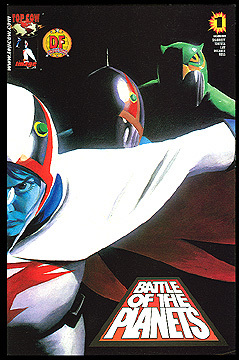 Information: A special limited-edition version of the first issue of the new Battle of the Planets comic, printed by Top Cow and Dynamic Forces. This version was available exclusively through Dynamic Forces, and it featured a different wraparound cover image by Alex Ross. The standard edtion pictured above, was limited to 7000 copies and featured a red logo on the cover. To see other variants of this issue, click here. Art by Wilson Tortosa, story by Munier Sharrieff. Full color.